Trails enter the preserve near a log cabin situated along Stadium Drive across from the Ralph Korte Stadium. The stadium lots can be used for parking for this access point. 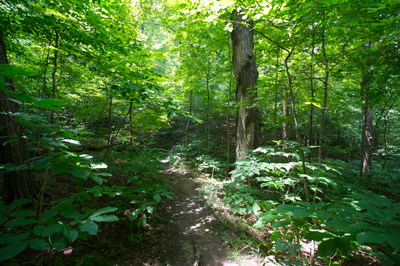 Trails also enter the preserve from the parking lot behind Prairie Hall. Parking at the residence halls is regulated, however, and special temporary permits are needed to use this lot. For university-affiliated persons conducting approved research or teaching activities, a temporary parking permit can be requested at the front desk of Prairie Hall. These locations can be viewed on maps of the SIUE campus.